It seems like it was not even a month ago that we heard about Maté Szabo’s submission to LEGO® Ideas being selected to be made into an official LEGO Set. And now it is due to be released on the First of April. Another day where Too Many Things arrive in the inbox in Rapid Succession. 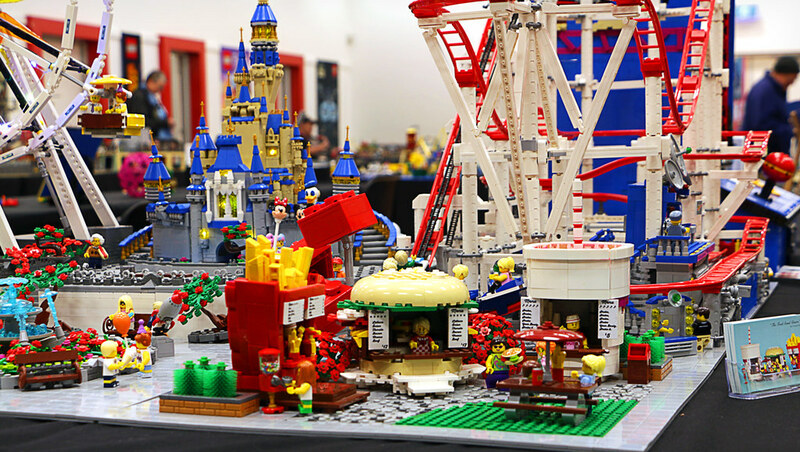 These include a Star Wars Fan Event at the LEGO House, a Survey about LEGO stores and two new Ideas Contests (replacing what was once known as Rebrick). These have all arrived via the Ambassadors Network, an online community where recognised Fan Media, and Recognised LEGO User Groups Gather… read on for further details. In which I ponder the nature of the television sitcom and its broader narrative development, new spinoffs resulting in decades of related programming, changes between fan designer and production art and finally consider whether or not this one’s for me. By the way, 21316 the Flintstones will be available for VIPs 20th February, and probably having its ‘regular’ release on March 1st 2019. One of my fondest childhood memories is coming home from school, and sitting down in front of the (Black and White) television for a couple of hours. It was the 1977 in Australia, and the typical afternoon television lineup consisted of a collection of 1960’s programs, both live action and animated: Bewitched, I Dream of Jeannie, Get Smart, Scooby Doo and The Flintstones. With their canned laughter and awkward situations, often caused by miscommunication or zany get rich quick schemes, virtuallyany character development that occurred was reset at the end of the episode. Apart from a different actor playing Darren in Bewitched, as if nothing ever happened, most of these stories followed a simple plot line, with new scenery and characters telling a similar story the next week. The Flintstones was unique amongst these programs, as it was probably the first show that would be considered to an animated sitcom: certainly a novel concept in 1960, when it was first broadcast. Fred and Barney – with their challenges at work, misunderstandings with their wives, the ritual Bowling tournaments, to say nothing of the Order of the Water Buffaloes. Congratulations Frostbricks on gaining 10000 supporters on LEGO IDEAS. 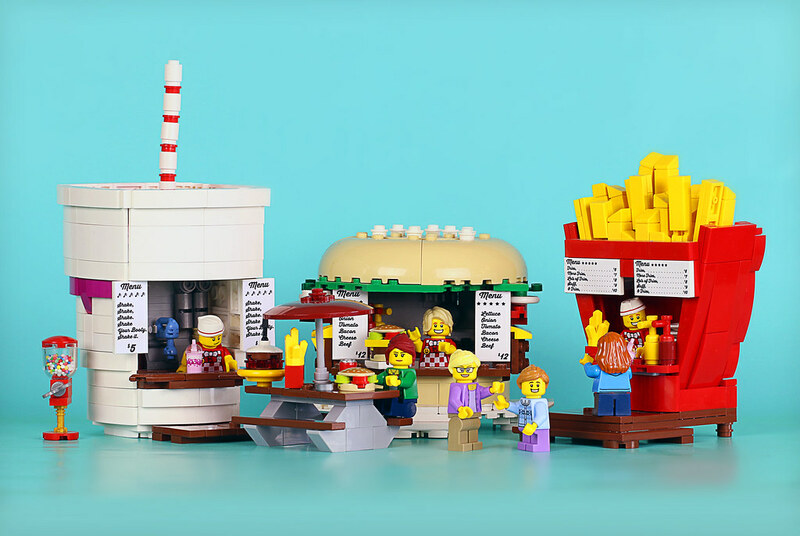 Congratulations to my friend Frostbricks who gained his 10000 supporters on LEGO Ideas earlier today for his submission ‘Food Stand Diners.’ Initially entered on LEGO Ideas in November 2017, it has taken a little over a year to reach this milestone. FrostBricks: Thank-you. Just thank-you. The support it has received is overwhelming, and none of it could have happened without the wonderful support of the community. What inspired you to build this model? Frost Bricks: The model was inspired by my love of food.It began with making life size food, in LEGO, that was realistic as possible. Something that could fit on any Foodies mantlepiece. 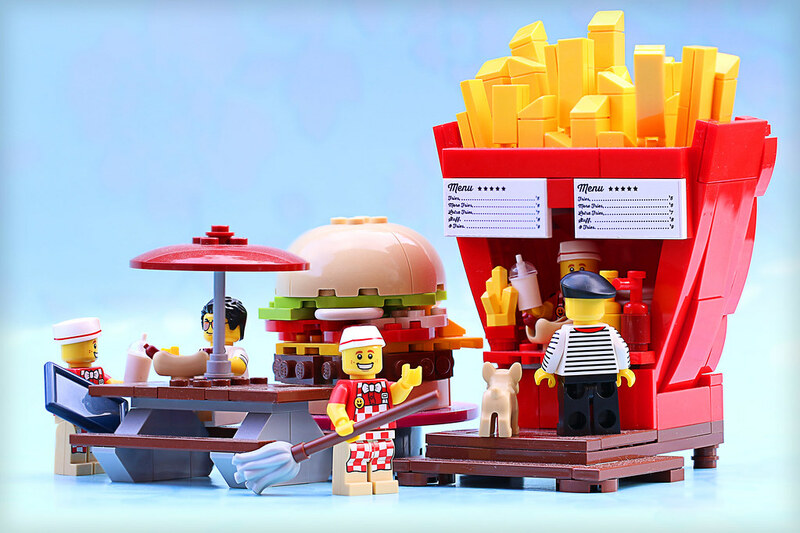 But I also wanted them to feel like they belong in any LEGO city,cos I love minifigs and creating small worlds, which is where the Foodstand aspect comes from; so the merging of those two things really. Do you have any advice for other builders aspiring to make a successful Ideas submission? FrostBricks: Just build. Build because you love it. Build because you’re passionate about it. And as you do, always ask “how can I build to my best?” Because the secret is just to practice. To keep on trying. And do do your best in all things. That’s it really. And I know it sounds so simple, that many might disregard it, so I’ll add one thing – keep a record of the things you create, so that you can go back every now and again and see just how far you’ve come. Because success is a ladder, but practice are the steps that help you climb it. And I think that applies to anything worth achieving in life. Thanks for those words of wisdom, Frostbricks, and I hope the review process treats you well! You can check out the original LEGO Ideas submission here. This entry will go into the LEGO Review process with recent 10000 club members in the near future, including submissions based on the international space station and Space-X projects. What do you think of this submission? It’s a bit different to many of the recent projects to gain 10000 supporters. We wish Frostbricks all the best with the review process, which we expect to take until sometime around the middle of next year. Until next time, Play Well! Once Upon a Time, there were two LEGO® Fans who had an Idea. Grant had the Idea first, to make a pop-up book out of LEGO bricks. Then he reached out to Jason, who had an Idea before. They told their friends about the Idea, and those friends told their friends. Eventually, a Lot of People said that the Idea was good. From days of long ago, from uncharted regions of the Universe comes a Legend: The Legend of Voltron, Defender of the Universe! A mighty robot, loved by Good, feared by Evil. As Voltron’s legend grew, peace settled across the galaxy…. I was excited to be offered the opportunity to review LEGO Ideas 21311 – Voltron . As I previously confessed, Voltron was not a major part of my upbringing. However, I have been catching up in recent days with the 1980’s cartoon series ( which in turn was based on the Japanese Anime ‘Beast King GoLion’). Others may prefer to take in the current Dream Works Series, Voltron: Legendary Defender, for a more contemporary tale, with a reduced serving of cheese. After a quick revision of a parallel childhood, I felt qualified to look at the box. It is a good sized box: similar in size to that which contained the Saturn V Ideas set, released just over twelve months ago. This box, however, contains 2321 elements, waiting to give a hefty dose of nostalgia to any child of the 80’s. In fact, you don’t have to wait to open the box for that feeling: the box art cries out 1984, with the background artwork shading from red to purple to the blue of a startled, with an underlying grid drawn in for good measure. Voltron, the giant, compound super robot almost fills the cover. In fact, it is printed slightly smaller than actual size. The back of the box shows how Voltron is made up of the individual Lion elements, as well as highlight the sword and shield. The process of the LEGO Ideas program is also outlined. On opening this set, I had a pleasant surprise. Many sets that I have opened this year seemed to have had their ‘contents settle during transport,’ with many boxes being barely half full of LEGO Bricks. This box appeared to be almost 80% full. Excitedly, I emptied the box over the floor revealing the bags inside: all 16 of them! These came with six manuals: One detailing the construction of each lion, and the final one showing how to build the shield and sword, transform the five robot lions into Voltron, and provides some background information on the television series as well as some notes from the design team and the fan designer. The manuals came in a sealed plastic bag with a sticker sheet. This sheet however, only had five stickers, for numbering the lions (as occurred occasionally in Voltron: Defender of the Universe, but not the original Japanese series). For the purposes of the review, I did not apply them. You could argue in favour of using printed elements here, but I suspect many will prefer the look without stickers. Nicely packed: the 6 manuals for Voltron, as well as the relatively minimalist sticker sheet. In the cartoon, each of the lions is piloted by a human, and it is a little disappointing not seeing the pilots represented here. However given a variable crew roster, and uniforms not matching up to the colours of the lions, not to mention the relative scale of the lions to a human, a minifigure representation might not be entirely appropriate. Indeed, there is not even space inside the heads of the lions to contain a microfigure. I’m sure someone out there will develop a creative solution.